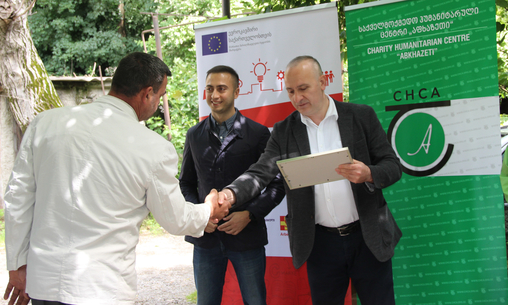 Within the scopes of EU funded project Qualification for Re-integration – a Way back into Society award ceremony for former inmates and probationers was conducted on 30 May in Telavi. The aim of the project is to contribute to the integration of persons in conflict with law into the society through the establishment of cooperation mechanisms among CSO, Business Companies and State Actors. The project is implemented by ASB Georgia together with CHCA and Center for Strategic Research and Development of Georgia. Various tools, such as: machines, toolkits, inventories and means of production were handed over to 11 beneficiaries to launch or develop the economic activities. The financial cost of material assets handed over to the beneficiaries is 400, 1200 and 3000 EURO. Up to 50 former inmates and probationers have been involved in the project activities in Kakheti regions. Each participant attended 4 days training on “Effective social/job seeking skills”. In addition, part of the beneficiaries attended vocational education training for 2 months and received financial support equivalent to 400 EURO in the form of material assets. Another part of beneficiaries passed business training and had possibility to receive financial support equivalent to 1200 and 3000 EURO in the form of material assets to start or enhance business activities. 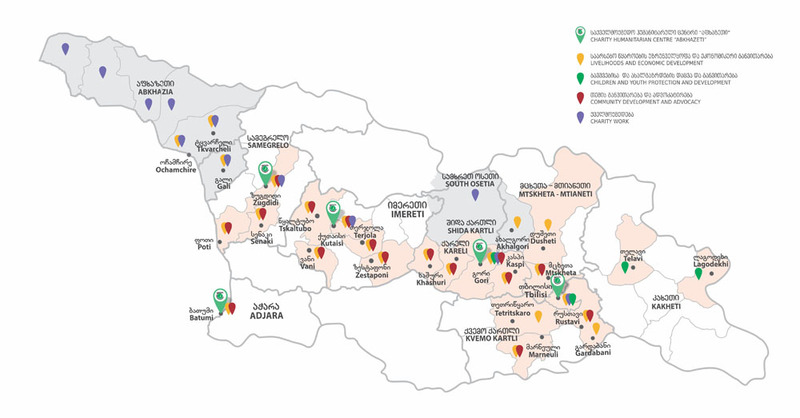 Project Qualification for Re-integration – a Way back into Society is being implemented in Shida Kartli, Imererti, Samegrelo-Zemo Svaneti, Kakheti and Tbilisi. The project ends in 2020 and 300 inmates, former inmates and probationers will receive different kinds of benefits under the project. In spring 2018 another stage of call for applications starts in Shida Kartli and Imereti regions.